Professor Michael McBride: So we want to understand diffraction patterns. It’s clear that there’s some relationship between the arrangement of the electrons that are doing the scattering and the pattern of the scattering you get. Right? At a particular angle there’s a particular intensity, and it must depend on how those electrons are arranged. But how is the interesting question. So what we’re going to do now is look just a little bit — — no one figures this out, in a real case; people have written fancy computer programs to do this. But so that it doesn’t seem mysterious, I want you to get the idea of how it works. Okay, so the first slide we showed, or the third slide actually that we showed last time, was made of a bunch of these things we call benzenes, the collections of six dots, and they’re all oriented the same way; that’s not very reasonable except when they get regular in a crystal, which is where we’re going. But anyhow, if you have a whole bunch of them, but randomly distributed, it turns out the intensity you get is stronger, proportional to the number of them that are doing the scattering. Right? But the pattern you get is the same you’d get from just one. So that’s why we use this funny slide. And this was the pattern that came out, this thing that looked a little bit like a snowflake, and I’d like you to understand why that hexagon of dots gives a snowflake. So we take the hexagon of dots, and what do we look for to see where scattering might be, to see — what’s the — remember what the trick is? The trick is to look at things that lie on equally spaced planes. Try to choose a set of planes so that as many of the electrons as there are will fall on or near that set of evenly spaced planes. So And this is two dimensions, so we’re looking for lines, or cross-sections of planes, right? So how can we draw lines on here, evenly spaced lines, so that all the dots will fall on them? Well we can do it this way, right? So they’re evenly spaced, three of them, and all the electrons fall on or near them. Notice, they don’t have to fall exactly on, because if they’re displaced a little bit, the phase of the wave will change a little bit, compared to the others; but only a little bit. So it just has to be near, not exactly on. Okay, so there we have it. Now, so that means that you’ll get scattering in that direction, where they will reinforce one another. Let’s go back to the display we were looking at before, here. Okay? We were talking about this just as class started. So a wave comes in, makes these things all move up and down, the electrons, here and here, at the same time. Actually, let’s make all three of them vibrate for current purposes. Okay. Now we’re interested at what angles light can come out and all these things will help each other out, reinforce one another. So as we go here and look at that vertical line, we see that they’re not all in-phase at that angle. But as we increase the angle, when we get to say here, it looks not so bad. The top and the bottom are actually exactly in-phase, but the middle one is exactly out-of-phase, and it’ll cancel out the top one. And if there were a whole row of these, the second one cancels the first, the fourth would cancel the third, the sixth would cancel the fifth, and so on; there wouldn’t be anything coming out. And now we go a little bit away from that. And it’s worth making a point here. Suppose that this were a very, very, very long line of scatterers, right? And the first two — let’s get to this place here where they’re all exactly in-phase; that’ll obviously be a very strong angle. But suppose we looked at another angle that was close to that, but just a teeny bit off. So the first two are off by just 1° in-phase, and the next one’s off by 2° in-phase; not much off, okay? So are we going to get pretty strong light coming out from that? Russell? Professor Michael McBride: If it’s a very long string, if the first one’s 1° out, by the time we get to the 180th, it’ll be 180° out, or exactly — so the 180th will cancel the first one, the 181st will cancel the second, the 182nd will cancel the third, and so on. Right? So it has to — if you have a really long string, it has to be exactly on, from one to the next, in order to get them so that you get something coming out. And what you get coming out then will be quite strong because it’ll be the scattering from the whole bunch of them. Right? Where did you see that in last week’s lecture, Friday’s lecture? Professor Michael McBride: Right, you saw it that you got very fine dots when you had a really long row of things. Okay, so back to here. So there’ll be things that are almost exactly in-phase, and it’ll be a certain angle at which they’ll be in-phase, and that angle is shown by the end of that arrow, and you get, therefore, a dot there, and also, by symmetry, the other five of the six dots; but you could draw the lines other angles the same way. Everybody with me on that? Okay, now so we look for electron density on or near evenly spaced planes. Now because it only has to be near, there are other directions we could draw it, so we get a set of planes where they’re near but not on; like here, right? Now one is a little above the plane, two are a little below the plane — , right? — Or vice-versa for the second line, right? But they’re pretty close, and they’re at a certain spacing. Now, that spacing is larger than the blue spacing. Does everybody see that? What does that mean about the angle at which the reflection will occur, or the scattering, where they’ll be in phase? Professor Michael McBride: The angle will be smaller. So the part of the snowflake that comes from that is here, right? A smaller angle because it’s a larger distance. And you can see immediately why that is, if we look at this thing, that if you look at the top to the bottom, where they’re far apart, the lines are far apart, you get the first reflection there. But if the lines are closer together, like these two, then you have to go to a higher angle in order to get that first one, first coming into phase. Right? So that’s that reciprocal relationship. Okay, so we get a set of six dots like that, and that’s most of the pattern. But there are other places too you can see it. For example, you can take those lines. In that set of lines, every — — the center of every dot is on a line. There happens to be a line in the middle that doesn’t have anything on it; but who cares? Right? The others are on evenly spaced lines. Right? So they’ll all be in-phase. Where will that one come, that reflection, close in or far out? Professor Michael McBride: Far out, and there you see it, way out at the edge. Can you see it there? Just a little bit with — I could turn the room lights down, but I don’t think it’s worth it. You can see that it’s there. And so there are six of them out there as well. Okay, so you got the idea of how by looking for evenly spaced planes you can predict what the pattern will be for a certain arrangement of electrons. Now, notice those ones far out are very weak. That’s because although the centers of the dots lie right on the lines, the lines are getting so closely spaced that there’s part of the electron density that’s not right on the lines, that in fact gets out to almost halfway between the lines. Right? And that part of the electron density will be canceling. So most of the electron density is all in-phase here, but some of it is out-of-phase, and as you get the lines closer and closer together, the fact that the electron distribution is finite, and not tiny points, means that things will get weaker and weaker as you go to higher angles. Okay, so there again we notice here that the closer spaced planes give higher angles. This is what we’ve just been talking about. Now, when you take a slide with a regular lattice of these benzenes, then — remember, if you took just one, you get this snowflake pattern. If you take a whole row, across the top, like that — — oh pardon me, I meant to say that one will be very weak, you can hardly see it. What you need is a bunch of them to cooperate, to see something that you can see. Now first we could take the whole row along the top, and we’re going to look only at scattering in the vertical direction; so I’ve narrowed in on the picture. But if we take that whole row along the top, remember, they’ll all scatter in-phase at the specular angle, because — for scattering up and down. So now it gets more intense because they’re all cooperating. For other directions they wouldn’t all be in-phase from one hexagon to the next, but for scattering up and down, where they’re all at exactly the same level, they’ll all be exactly the same. Okay, now suppose I add the next row. Will they be in-phase, for the same direction of scattering up and down, where that top row is all in-phase? So we would get the scattering shown here, right? Stronger than it was before because it’s a bunch of these things now, right? But still not really strong. But let’s add in the next row. Is that going to make them all stronger again? No, most of the time they’ll be out-of-phase, from the next row, for scattering in this direction. Right? Most of the time they’ll be out-of-phase, but for particular angles they’ll be in-phase. So in fact what that will do, if we add the next row, we’ve made the picture brighter because we’ve got twice as many things scattering now, but there’ll be bars across it, like that. It’s always the same pattern, getting brighter and brighter as we add more of them, but at certain angles they’re in-phase now and at certain angles they’re out-of-phase, from one pattern to the next, or from one row to the next. Now, what’s going to happen if we add the whole sheet of them? Can you see? Sam? Professor Michael McBride: Ah, there’ll only be really precise angles, at which they all interfere; otherwise the 180th will interfere with the first, the 181st with the second and so on. Right? So if we add the whole phase, the whole thing, then if we look at the pattern it’s going to be brighter, right? But it’ll be only dots, only at very precise angles. Right? And that’s what we saw when we went to this final picture for scattering from a lattice. So what this means is that the lattice repeat concentrates the snowflake scattering into tightly focused spots, on a regular pattern. Right? So this is the diffraction from a 2-D lattice of benzenes, which is the same as the underlying snowflake that came from just one, but it’s as if it were being viewed, as I said last time, through a pegboard. Right? All that scattering gets concentrated into a few points, very bright, and these regular points. Now some people seemed not to know what a pegboard was, so I took a picture of a pegboard over the weekend. How many people have never seen a pegboard before, just to calibrate me? Okay, most people have seen a pegboard. But you can put these hooks in it and then hang whatever you want on it, like tools or pictures or whatever you want to put on your wall. Okay, so it’s like looking through the holes in that, at the snowflake pattern. Now, there are two, quote, spaces that get talked about: direct space or real space; and diffraction space or reciprocal space. Okay? So the crystal is the real thing that you’re interested in, and diffraction photo is in diffraction space; you see these dots that Lowy Laue saw, for example, for copper sulfate. Right? So in real space you have a unit cell structure; that is, the thing, the pattern that then gets repeated to make the crystal. But you have the pattern, right? And that gives rise to this fuzzy pattern, like a snowflake in reciprocal space. And then you have a crystal lattice, a regular repetition of these patterns, right? And that’s as viewing through the holes in the pegboard. Okay? And remember that decreased spacing in real space corresponds to increased spacing in reciprocal space; which is of course why it’s called “reciprocal”. Okay, so that’s what we want to understand about how it works. Right? There are patterns which give rise to patterns in reciprocal space, that fuzzy thing, and then if you have a repeating lattice of that, it gets concentrated into particular points; but it’s the same underlying pattern. So there’s the pattern, which is the structure of the molecule, and there’s the lattice, which is the structure of the crystal. Okay, now let’s look at the light bulb filament, the last thing we looked at, and see why the scattering from that looks the way we do — — looks like this X with dots along it. Okay, so we take — — we want to find if there are electrons on this helix, right? We can find a set of evenly spaced, parallel planes like the yellow ones here. So we’ll get scattering perpendicular to those planes. And sure enough there it is, that spot. But we could also take a set of planes, and it goes not only up but also down, both branches; both directions of that particular branch of the X, come from the same planes. Okay? But you could make planes that are twice as close to one another. Right? What will those give rise to? Professor Michael McBride: Twice as far out; the sine is twice as big actually, not the actual spacing. But it’s that one, the second one out along the branch. Okay? Now, will that be — — do you expect that to be brighter or not as bright as the first one? Professor Michael McBride: Not — well it probably will be not as bright, and the reason is that for — there are two things that have to do with the brightness. One is how much density there is on the planes versus how much there is between the planes. Right? And we see here that — say take the original yellow one — there’s a lot; all this stuff is nearly on the plane, and halfway between the plane there’s not very much, just a thin cross-section of the wire. Okay? But as the planes get closer and closer, the fact that the wire has a finite thickness means that some parts of the wire, the same part of the wire, are out-of-phase compared to others. So because of the finite thickness you expect it to slowly fall off in intensity as you go out; but you’ll then get the third one along the branch and so on. And you can do the same trick in the other direction. Right? So that’s why it’s an X. You can draw the analogous mirror image lines. Okay, now what does the X, the angle of the X tell you? The X could look like this, or it could look like this, right? What do you learn from that, the angle that the X makes? Student: How tightly wound the helix is. Professor Michael McBride: How tightly wound the helix is, because if the helix were very tight, then the planes would be like this, and if you grabbed the spring and stretched it out, they’d look like this. Right? So the angle of the X tells how tightly wound the helix is, tells the pitch of the helix. Okay? What does the spacing of the spots tell you? Did you do the homework I suggested for today, that you didn’t have to hand in? Then you’ll know what the spacing of the spots tells you. If you know the wavelength of the X-rays, or of the light in this case, what does the spacing of the spots tell you? Professor Michael McBride: It tells you what the actual distance is between successive turns of the helix, how far apart the planes are. So it tells the scale of the helix, right? The angle you get from the X, but how big the actual helix is you get from the spacing of those dots, if you know the wavelength and the distance that you’re magnifying; in the case of the demonstration, the distance from the slide at the back of the room to the front of the room, for seeing this. And the spots weaken successively because of wire thickness, as we just explained, as you go on out. Now, that looks very much like Rosalind Franklin’s Bb-DNA photograph from 1952. So we see the helix and we see how angled the successive turns of the helix are, what the pitch of the helix is, and from the spacing of the dots we get how big the actual helix is. But there’s something funny. The intensity doesn’t just evenly decease as you go out. Instead of being strong, not quite as strong, less strong, weaker, very weak, as you go out, it goes weak, strong, strong, very weak, strong. Now why is that? Why do you get such a funny pattern of intensities? Let’s look here at this thing again. Remember where, if we looked at the first, second, third and so on, we saw that they come in and out of phase. But let’s suppose — so it would be, if you have things that are twice as close together here, as in the first case, what effect does that have on the actual pattern we see? The pattern we saw, if we had only every other one, was here the direct beam, first reflection, second reflection, third reflection, fourth reflection. How does it differ if we add one in between? Okay, here’s the first reflection — can we see that, if we have all three. ? That’s what would’ve been the first reflection if we didn’t have the intermediate one. Do we see a reflection here, if we have a whole row of them? No, because every other one cancels out. So we won’t see that one. How about the next one? Student: It’ll be very bright. Professor Michael McBride: Yes, it’ll be very bright, because there’s more doing the scattering. How about if we go to the next one? No, nothing there, cancelled, right? How about the next one? Do you perceive a pattern emerging? What is it? What? Student: It’s successive; you see it, then you don’t see it. Professor Michael McBride: Can you say it in a more mathematical way? Suppose we numbered them. The one straight ahead we’ll call zero; then there’ll the first, one, two, three, four, five. What happens when we put one in between? Professor Michael McBride: Is one there? This was one here, right? There was one for the top and bottom. Is that there? Professor Michael McBride: How about two? Professor Michael McBride: How about three? Professor Michael McBride: No. How about four? Professor Michael McBride: What’s the — can you state it mathematically? Professor Michael McBride: Lexie, what do you say? Professor Michael McBride: Can’t hear very well. Professor Michael McBride: Which ones disappear? Professor Michael McBride: The odd ones, one, three, five, seven, nine; the odd ones disappear but the even ones are still there, if we put an extra one in between. Now let’s think about DNA. Here’s a helix, right? But what do you say about DNA? Is it just a helix? Professor Michael McBride: It’s a double helix, so there are two helices. Okay, so suppose we have — there are the successive turns and we get scattering at a certain angle — but suppose we make a double helix, now what’ll happen? Lexie, you’re going to help me again. Professor Michael McBride: How different will it be if we have a second helix wound halfway between the first helix? What will happen to the — what we — from one helix we had one, two, three, four, five, six, seven, eight, nine angles, right? What happens now? Student: You’re missing even numbers. Professor Michael McBride: Can’t hear. Professor Michael McBride: Ah! All the odd ones disappear. Right? So what would you have expected to see in Rosalind Franklin’s picture then? Right? It would be weak, strong, weak, strong, weak, strong, right? But generally getting weaker as you go out because of the finite thickness of the wire. Is that what we see? No, we saw — the first one is very weak, strong, strong, very weak, strong. Can you see any — how could that be? What is that telling you? Yes? Student: They’re not perfectly in-phase. Professor Michael McBride: What do you mean they’re not perfectly in-phase. Professor Michael McBride: Ah. Maybe the second one isn’t halfway between the turns of the first one. Right? What happens? So the planes are twice as close there and that would cancel every other reflection, all the odd ones. But suppose it’s like that. Did you ever see a situation like that before where what repeats is not a line but a pair of lines? Angela? Student: The second diffraction — . Professor Michael McBride: The second diffraction pattern we looked at was of that sort, which showed the same dots but the intensity got modulated. Remember? Okay, so let’s, instead of doing this where we have equally spaced ones, let’s do one where they’re not equally spaced, like this. Now — oops, it came loose here; here we go; oh no; there we go, okay. Now consider the top and the bottom one, which are in successive turns of the same helix, and this one is offset in the middle. But consider just the top and the bottom one. Okay, there’s the first reflection, the second reflection, the third reflection, the fourth reflection, everybody see? Between the top and the bottom. Now tell me what happens if I add that other one offset this way. How about the first reflection there, is that going to be strong? Professor Michael McBride: No, because this one is canceling it. And remember, there’s also one like this below this one; remember, it’s a really long row of these things. So it gets almost perfectly cancelled; not quite because it’s not quite — there would be exactly the minimum, and when the first and the third are in-phase, the second one is not exactly out-of-phase, but very close; very weak, that reflection’s going to be. Now let’s go to what would be the second reflection of the single helix there. How about there? Professor Michael McBride: Yes, the second one now is helping out a little bit; not perfectly but it’s — in fact, probably if we go just a little bit further maybe it’d be better. But anyhow there’d be a reflection there. Okay? Now how about if we go to the third? That’s as good as the second one, right? And how about if we go to the fourth? Would the fourth — if they were evenly spaced, what would you expect for the fourth? Professor Michael McBride: Very strong, right? So let’s go to the fourth; one, two, three, four. What should it be? Professor Michael McBride: Really weak. And how about the fifth? Professor Michael McBride: That’s precisely what she saw, right? Weak, strong, strong, very weak, strong. So that’s how much, this is how much it’s offset from the center, in order to get that sequence of intensities. Everybody with me on this? Okay. So that’s that repeated pair pattern that we saw before. And there you see that the outer coil of the DNA, which has phosphorous in it, with a lot of electrons, that’s very much like this helix. Okay, much more electron density near these planes than between them, than halfway between. But there’s also much more electron density on those, near those blue planes than in between, for the same reason, and that means that you get those spots on the side. That tells you the diameter of the helix. Okay, and the things top and bottom tell you the base stacking distance. Let me back up just a second to show you what we mean, right? So there are a bunch of electrons here, a bunch of electrons here, a bunch here, a bunch here, and that gives scattering in this direction. So all that information — the helix diameter, the fact that it’s a helix, the fact that it’s a double helix, the fact that it’s an offset double helix, and the diameter of the cylinder, are all easily read out if you know what you’re looking for; which Crick knew, because he had been studying helices of proteins, so he knew about — he knew from helix scattering. Okay, so knowing the molecule’s electron density, as we knew our artificial sort of benzene, or this DNA, it’s easy to calculate the crystal’s diffraction pattern, especially if you have a computer to help you out; but it’s not an intellectual challenge, it’s just work. Right? Using pretty heavy- duty math, people got the Nobel Prize for developing it; or a canned program, (that’s what they got the Nobel Prize for), you can go the other way and go from the X-ray pattern to what it was that was causing it. Right? What we did was go from what’s causing it to the pattern, but in fact you can go the other way now when you press a button on a machine. And you get out the electron density at every point in space. Okay, that’s the yield from an X-ray structure. Why don’t you get the nuclear positions, why do you get the electron positions? Professor Michael McBride: Alex? Can’t hear. Student: It’s too big to diffract. Professor Michael McBride: Yes, it’s too heavy, so it doesn’t vibrate, the nuclei, so they don’t function as an antenna, to give off the new waves the way the electrons do. Okay, so you get a result, which you can plot on a map. Now in the olden days when I started doing this kind of thing, the kind of map you got out was a big sheet of computer output paper, and it had numbers on it, and a given piece of paper was a given slice through the “unit cell’, through the pattern, and numbers were printed out that said what was the electron density at that particular point on that level. So you had an x axis, y axis, and at this point it was seventy-five, forty-two, fifty-five, eighty-seven, or whatever the number is, and so on. And what you do is take a felt tip pen and connect dots of equal size, and you’d get a contour of that particular electron density. And here’s where that was done for a particular compound. This is taken from a book written at that time by Stout and Jensen. And you drew these by hands because you didn’t have a computer that could draw — that could figure out where to draw it and so on. So here were atoms in a particular crystal structure. Then you had a whole bunch of sheets of paper for different slices, through the electron density; stack them up, right? Now sometimes the particular slice you’re working in went right through the middle of an atom, so you got very high electron density. Sometime it just barely touched the atom, right? So you see here that that one, that atom, this particular slice, was very near the nucleus, so we got high electron density. But that one, the nucleus was not in this plane, so you just got a little glancing blow at it. Okay? But you could draw these things on acetate or plastic sheets and stack them up, right? So this was the model made for the first determination of the structure of penicillin; in fact, the potassium salt of penicillin. Where’s the potassium atom? How can you distinguish potassium from nitrogen or carbon or hydrogen or oxygen? Professor Michael McBride: It’ll have a lot more electron density. So do you see it? There’s the potassium, lots of density. Okay, now here’s a molecule that happened to be flat. So it was possible to slice through practically all the nuclei. It’s not a very common type of molecule, but this one is, rubofusarin. Okay, now these contours are drawn at intervals of one electron per cubic angstrom. Right? So the first one is one electron per cubic angstrom, two electrons per cubic angstrom, three electrons per cubic angstrom and so on. Now there are both carbons and oxygens in this. How can you tell which ones are oxygens? Professor Michael McBride: Yeah, Yoounjoou? Student: They are more electronegative, so they should have more contour lines. Professor Michael McBride: They should have more contour lines. So if we look here, we see that that one goes up to five electrons per cubic angstrom; one, two, three, four, five rings, right? That one goes up to seven electrons per cubic angstrom, and so do those. Right? So those are the oxygens. Okay? And there’s a picture of the structure and you see indeed those atoms are oxygens. Now, what is our fundamental goal of looking at this stuff, what do we want to see? Professor Michael McBride: Bonds. Do you see bonds? What does it look like? It looks like just a bunch of balls, just atoms put there. Was Lewis right? Are there electron pairs halfway between the bonded atoms? No, it’s just atoms. Okay. Why are there no hydrogens? Professor Michael McBride: Because they have hardly any electrons compared to the others, right? So they’re a very weak thing. Okay, now those are bonds. You can see them there. Where did those lines come from? Professor Michael McBride: Angela, what did you say? Professor Michael McBride: Yes, you drew them. How did you know where to draw the bonds? Student: You connect the dots. Professor Michael McBride: You connect the centers of the rings, right? Those are the bonds. Now how do you know what’s a single bond, what’s a double bond, what’s a triple bond? Professor Michael McBride: You notice in the structure here, on the bottom right, there are double bonds and single bonds. How do I know which is which? Is there any way of knowing? Elizabeth? Student: Maybe the distance between. Professor Michael McBride: Ah, the distance! Double bonds should be shorter than single bonds. And, in fact, notice that here we have short, long and intermediate. Why intermediate? Professor Michael McBride: Why do I draw a dotted line there? Professor Michael McBride: Because we have this, look here; resonance, right? So there are one- and- a- half bonds. Right? Okay, but fundamentally what we see are spherical atoms, right? No bonds, no unshared pairs on oxygen, just atoms. So was Lewis way off base? Actually you can see the bonds with X-ray, but you don’t look at total electron density the way we’re looking at it. What you look at is difference density; you see how different is the picture I actually determine from what I would’ve expected if they were truly just spherical atoms, undistorted. How do you find — how would you make such a map? So you have these pieces of paper that say how much the electron density would be at all different points; experimentally, how much it is experimentally. Now I want to see how different is that from if I just had spheres for the atoms. What would I do? I have to find out what the spheres would look like, what density they would predict at all these different points, and then do what? Professor Michael McBride: Subtract, right? So that’s the difference density. Sometimes it’s called deformation because it’s how much the electron distribution gets deformed when bonds get made. Okay, so you take the observed electron density, which is from X-ray, which is experimental, and you subtract atomic electron density, which you calculate somehow. You know what spherical atoms would look like; we’ll get to that next, how you would know what that is. But anyhow, how do you know where to — when you’re going to do the subtraction you have to make sure you position the atoms properly, to be subtracted, right? How do you know where to put them? How do you know where to put your spherical atoms so that you subtract it? Yes? Student: On the center of the rings. Professor Michael McBride: You put it on the center of those rings, right? Okay, so let’s look at a case like this. This was done by Leiserowitz and Ziva Berkovitch-Yellin thirty-three years ago. So this is an interesting molecule because it has lots of different kinds of bonds in it: single bonds, double bonds — in fact three double bonds in a row — and also benzene rings that have these resonance bonds. Okay, so we’re going to look first at one of the benzene rings. Okay? So this map that I’m showing you here is a difference density map. It’s the total, minus what it would be for the atoms. But notice what was subtracted is just the carbon density; didn’t subtract hydrogens. So let’s look at the features that are big here. This is how the electron density changed in forming the molecule from atoms. Okay? So first look up there. There are some very dense contours, right in the middle up there, and that’s the hydrogen which was not subtracted, right? So it’s the biggest game left in town, once you’ve subtracted the spherical carbons. Okay, so that’s — and the total amount of intensity in that region is one electron, which is what you expect. Now the total amount of deformation density in this region, where there’s a single carbon-carbon bond, is only 1/10th of an electron. What would Lewis have said? Two electrons, it’s 1/10th of an electron. Okay, now let’s slice that — and within the carbon-carbon bonds of the ring, the aromatic ones, it’s bigger. Why bigger? Because it’s partially double bond in the resonance structures, right? Okay, so it’s 0.2 electrons for those ones in the ring. Now let’s slice it and turn it so we can see its cross-section. And it’s round; no surprise there. But let’s slice the ones in the ring and turn them. It’s oval, not round, the bonds are not round. Why? Professor Michael McBride: Ah, because they’re partially made up of these p orbitals that point in and out of the ring, that distort it from being round. Okay, now let’s look at the double bonds that are in the middle of this molecule, okay? First that one; we’ve already seen that bond before that was 0.1, had a round cross-section. But let’s look at one of the double bonds. Not too surprisingly it has more electron deformation density in it; 0.2, right? And the one in the middle actually has 0.3. Now they’re both double bonds, so probably they look similar, and in a sense they do. If we slice the first one, and turn it, it’s oval for the same reason as before; there’s a p orbital pointing in and out of the board, and if we look at it below, part of the bond is caused by overlapping, as we’ll see, of those p orbitals. So it’s got an oval, up and down shape. How about the next one? If we slice it and turn it, it’s also oval in cross-section, but perpendicular. Right? What do you expect the next one would look like? Professor Michael McBride: It’s symmetrical; it’ll look like the first one again. But here’s something interesting. That cross-section of the middle one showed the deformation due to the pink but not the deformation showing — due to those neighboring blue ones. There must be something different about the interaction at the end and the interaction in the middle. Does everybody see that problem? You might think the middle one would be round or clover-leaf shaped, but it’s not, it’s distorted in the in-plane direction. But to understand this, you have to be patient and wait till next week, or later this week, when we start getting into quantum mechanics. But notice that it’s as if the carbons formed bent bonds. So the bonds from those central carbons at the end go up and down, but the ones in the middle are in- plane. Now how many electrons are there in a bond? So here we’re going to plot how many electrons vertically, and how long the bond is, which is related to whether it’s single, double, triple. In fact, a single bond is there; a double bond and a triple bond have those distances. Now if you — and in fact you could also do a one-and-a- and a half bond, those bonds in the benzene ring. Now what would you expect this to be? How many electrons — if you were Lewis, how many electrons would you have in a single bond? Professor Michael McBride: Two. Double bond? Professor Michael McBride: Three, okay one and a -and-a-half. Okay, so there’s what you would expect for the plot, if Lewis was right:; two, four, six. Okay? Now we can take this molecule that we just looked at and see how much electron density there is in each of those bonds — and I’ve color-coded it — and it looks pretty darn good. Right? Hooray for Lewis. And in fact the people who did the work, Leiserowitz and Berkovitch-Yellin, looked at a bunch of other structures too and added those to the same plot, and they’re not bad, except the scale is wrong. Instead of being two, four, six„ which I’ve faded out here, it’s 0.1, 0.2, 0.3. So bonds are a very minor game in the distribution of electrons. Lewis, in a sense, was sort of right, there is electron density shifted between the atoms to hold them together, right? But much less than pairs of electrons. In fact, this amount of bonding density is about 1/20th of what Lewis might have said, but never did say, because he wasn’t that naïve. Okay? So instead of getting two, you get a 20th of two; 0.1. Okay? So bonding density is about 1/20th of a Lewis. Incidentally, the unit “Lewis” is used only within this class. Okay? So here’s another example done by Dunitz in Switzerland and these people who were the — Schuyler Seiler and Schweizer, who were Swiss, who were the progeny of watchmakers and people that do very precise work; because to do this you have to have really precise experimental work, if you’re going to subtract something from something else and have the difference be meaningful, when the numbers are almost precisely the same, right? Remember we looked at the total electron density. It looked just like spheres. So you have to be really good with this if you want to have this be meaningful; and those guys were really good. This was done, what, twenty-five years ago. So they took this molecule, which is highly symmetric, which is great. Remember it’s got its resonance structure, so all the bonds around the middle are the same, top and bottom. Okay, so we need only look at a quarter of the molecule, or for convenience a little bit more than a quarter. So I’ll blow it up here. And there is the electron difference density. So this is how the electrons shifted during formation of the bonds. Okay, so there’s a carbon-carbon aromatic bond, a bond and a half, and if you turn it and look at it, it’s distorted the way you expect, just as in the previous experiment we talked about. Here’s another one, same deal. Now here is a single bond, carbon-carbon single bond. What’s it going to look like in cross-section? Professor Michael McBride: Round. Good. Now here is a carbon-nitrogen triple bond. This is something new. What’s it going to look like in cross-section? Maybe like a clover-leaf, huh? Like that, it looks like that. It’s round. It’s not clover-leaf, and it’s not a diamond, it’s round in cross-section. So we’ll address that later. What’s that? That’s not a bond. Professor Michael McBride: That’s the unshared pair on Nitrogen. Now what’s special here? What are we looking at? We’re looking at the carbon-fluorine bond. Does it look like the carbon-carbon bonds, or carbon-nitrogen? How’s it different? There’s no there, there. Right? There aren’t any electrons holding carbon to fluorine. What the heck is going on? Where is the C-F bond? This brings up the second great question in the course. What’s the first question? Students: How do you know? Professor Michael McBride: How do you know, right? And the second question is illustrated by this film clip. Come on baby. I worked hard on this. Okay, I’ll tell you what it says. Okay. [Laughter and applause] “What do you think of him?” “Compared with what sir?” “Exactly.” That’s the second question, compared with what? In anything quantitative, even many qualitative things, that’s the question, and that’s why we’re in problems here looking for the C-F bond. We already saw this question when we talked about resonance. Remember, I asserted that when you have resonance the molecule is unusually stable. What should you have asked? Professor Michael McBride: Compared to what? Right? In that case it turns out it’s compared to observed or calculated energy. Compare the observed or calculated energy, (what really happens), to what you would expect if it were not resonant. And we’ll talk later about how, on what basis, you might have an expectation. Now we’re talking about difference electron density. So what do we compare? Professor Michael McBride: We compare experimental electron density, (or it could be calculated, if we can use quantum mechanics to calculate it) — , but compare experimental electron density to what? What have we compared it to? 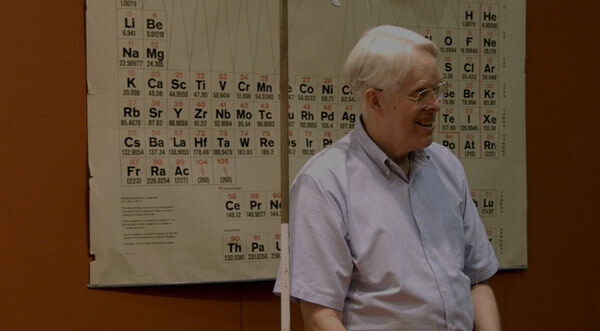 Professor Michael McBride: What it would be if it were just atoms. Right? But what kind of atoms, right? We compare the observed or calculated total electron density to the sum of electron densities for a set of undistorted atoms. Now what’s an undistorted atom? Okay. Now, to avoid Pauli problems — and this isn’t the time to discuss what those are, we need to subtract not an unbiased spherical fluorine atom, which if you count up how many electrons there are on fluorine, each quadrant of space around fluorine — of which there will be four — each quadrant will have one and three three-quarters electrons in it. Right? You multiply that by four and you get seven electrons, which is the valence electrons of fluorine, right? But you can’t have one and three three-quarters electrons from fluorine, and also an electron from carbon in the same place. That’s too many electrons in the same place, right? So what you have to start with is not an undistorted spherical fluorine atom, but a fluorine atom that’s prepared to make a bond, which has only one electron in the region where it’s going to make a bond. So if you subtract a spherical one, you’re subtracting too much from the region of the bond, right? So that’s why you don’t see any electron density in there. So, and if you want to understand this better than I’ve explained it, go on the Web and look at Professor Dunitz explaining it. We have a little movie of him talking about this particular problem. Okay? But at any rate the conclusion of all this is that bonding density is about 1/20th of a Lewis. All right? And it’s time for me to quit. We’ll go on with this next time. Reading assignments, problem sets, PowerPoint presentations, and other resources for this lecture can be accessed from Professor McBride’s on-campus course website, which was developed for his Fall 2008 students. Please see Resources section below.